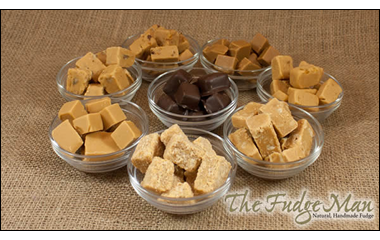 The Fudge Man is an independent artisan fudge maker. He blends milk, sugar and butter and other delicious ingredients into melt in the mouth fudge. There is no fuss, no gimmickry, no showmanship and razzmatazz just really good traditional fudge like your Grandparents used to make. The secret magic that makes this fudge different from all the others is the simple honest ingredients and skillful cooking. The ingredients are brought in small quantities and the fudge is produced in carefully controlled batches in order to preserve the product quality.